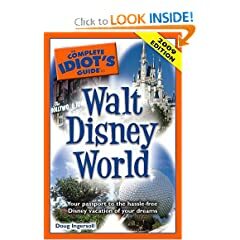 Doug Ingersoll has written several books on parenting, including The Complete Idiot’s Guide to Walt Disney World (2008 Edition published September 4, 2007, 2009 Edition published September 2, 2008, 2010 Edition publishing September 2009) and Plan Your Walt Disney World Vacation In No Time (August 13, 2005 ). It is written to help first time visitors prepare for a Walt Disney World vacation. The focus of the book is to make planning quick and easy for the novice, knowing that most of us have a day job, and it is not planning a Disney World vacation! My love for sharing Disney advice spans beyond my books; I am also the only dad on the Walt Disney World Moms Panel – www.disneyworldmoms.com , an online resource for planning Walt Disney World vacations. I think that fathers need to be full partners in the development of their children. Not just because it is their responsibility, but because I believe that we raise healthier children when they see how all the adults in their lives need to, and want to, play a role in their lives. Let them see you doing your share. I want my girls to know that I am not just there for the fun times, but that I am there to push the vacuum cleaner, to change the laundry, and to do the dishes. I want my daughters to know that their mother and I are partners in life, in all ways, so that they will seek out someone that will treat them as equals as well. I think we all (and yes, I include myself) are guilty of hundreds of little judgment errors that can cause bigger problems down the road. A radar detector in the car tells kids that something is wrong only if they get caught. Joking with your wife about the appearance of someone at the store tells them that we judge books by their covers. Your question asks what the biggest error is, and I think that this myriad of little errors is exactly that. Not just because they cause so many problems, but because with just a little effort we could avoid them. Being a dad who started a bit later in life (first child at 39); I am well aware of the saying. From day 1 I made sure that I was able to be as involved with my children’s lives as possible. I leave work at 4:59 every day. I don’t get to the golf course more than 1 or 2 times a year. Sure, I am not zooming up the corporate ladder, and my handicap is not exactly PGA-ready, but those are games, and my kids are my life. Yes. My mom has a theory that every high school age student should have to spend one summer each working jobs that are; a) reliant on tips; b) dealing with customers in a retail setting, and, if possible; c) in some job requiring physical labor. This will help them develop an appreciation and respect for the people who wait on them, and the work that they do. I think that this, paired with an active parenting plan about teaching them skills in managing money and the value of money are essential to preparing them for the realities of the world they will someday enter. Self esteem and parental support is essential to developing a well-rounded, emotionally stable adult. I want my kids to know that they will always have Mom and Dad there as a safety net, both economically and emotionally. At the same time, however, I don’t want to raise spoiled brats who need to be patted on the back for everything little thing they do. They need to know that you do the right thing not for the rewards that may come, but just because it is the right thing.